This adventurous tour takes you from Vietnam’s charming capital, Hanoi, to the magnificent limestone cliffs of Halong Bay and the lush tropical forests of Cat Ba Island. Take an overnight train to Lao Cai and trek through picturesque mountain villages populated with Northern Vietnam’s colourful ethnic minorities. Fly to cosmopolitan Bangkok to experience the contrasts between new and old in this pulsating metropolis. End your trip in beautiful Krabi, Thailand relaxing on sun-soaked beaches and enjoying outdoor adventures like rock climbing and kayaking. Start this tour of South East Asia in the French colonial city of Hanoi. Founded in 1910, Hanoi is a city of lakes, parks, trees, age-old colonial mansions, and wide, bicycle filled boulevards. Visit world famous museums and explore the bustling Old Quarter where trade carries on as it did a century ago. Spend a night cruising on a traditional junk boat on Halong Bay, marvelling at the limestone cliffs as the sun sets. Trek through Cat Ba Island national park to its famous caves, and visit nearby Hai Phong to tour its remarkable architectural sites. Return to Hanoi to catch an overnight train north to Lao Cai, the gateway to Sapa, located near the Chinese border at an elevation of 1650 metres (5412 feet). In the shadow of Vietnam’s highest peak, Fansipan (3142 metres), the region holds countless trails and walks for all levels of enthusiasts and provides an introduction into the lives of the isolated communities of the north. After thoroughly experiencing the north of Vietnam, travel to Bangkok, Thailand. In this dynamic capital city, visit exquisite temples and tour the expansive system of canals aboard a traditional boat. Finally, relax in Krabi, home to some of Thailand’s most spectacular scenery, both on land and sea. Rock climb on nearby Railay Beach or snorkel in the pristine turquoise waters surrounding this magical place. Early this morning, you will be picked up from your hotel for a sea kayaking adventure in the mangrove forest of Ao Thalen. The area features flora and fauna that aren't easily found, some traditional local villages, and narrow channels that cut through towering cliffs. Several species of kingfishers, herons, and crab-eating macaques are almost guaranteed to be seen as you journey the mangroves, and you may have a close encounter with monkeys or macaques. Upon completing your paddling route, return to the pier, change your clothes, and enjoy lunch at a restaurant with a nice view. After lunch, transfer back to your hotel. Take a boat out to Railay Beach, home of the famous rock-climbing activities. With a wide range of courses to meet all levels of climbing ability, it doesn’t matter how old, young, or unaccustomed to climbing you may be; the local instructors will find something that suits your ability and that you will enjoy climbing. Early this morning, you will be picked up from your hotel and transferred to a hot spring where you can relax. After your dip in the hot spring, explore the surrounding lowland rainforest area for a chance to see Gurney's Pitta Bird, which was once believed to be extinct. Proceed with a walk through the rainforest to reach Emerald Lagoon. Admire the different plant and animal species you encounter along the way, and upon arrival, enjoy a swim in the clear blue-green water. Continue to a local restaurant for lunch and visit Tiger Cave Temple (Wat Tham Sua), one of the most beautiful temples in Krabi. Journey to the top of the mountain to admire the golden pagoda and beautiful views of Krabi Town and Khao Kanab Nam. * In Thailand, additional supplements may apply between 23 December – 5 January with a set minimum of consecutive nights required for bookings between 23 – 25 December. Special conditions apply between 28 – 31 December. * For Day 12 (Bangkok City Tour) it is recommended that for religious reasons, ladies have their shoulders covered and do not wear shorts or very short skirts. No sleeveless tops and the sleeves have to be part of the top. Gentlemen should wear trousers and short sleeved shirts. Shoes must be removed before entering the Emerald Buddha Temple. Upon arrival in Hanoi, airport reception and transfer to the hotel in a private vehicle. Depending on arrival time, spend the remainder of the day at leisure. Leave Hanoi for Ninh Binh. Start the exploration with a leisurely bike ride (about 5km) through paddy fields to visit Dong Tam Village. Chat with the locals and take part in lunch preparation. Enjoy lunch with the family and then take a sampan ride through the But Cave Complex. Explore the dry caves as wells as the water caves. End the trip at Thung Nham Dock and drive from there to Emeralda Ninh Binh Resort. Overnight in Ninh Binh. Depart for the Cuc Phuong National Park. On arrival, visit the Endangered Primate Rescue Center. If time permits, take an optional visit to the Cave of Prehistoric Man before having lunch at a local restaurant at the headquarters of the park. After lunch, drive to Bong Station and take a walk through the forest to see the diverse flora and fauna highlighted by a backdrop of perennial trees. The 7km trail passes through giant trees to a 1000 year old tree. Afterwards, drive back to Ninh Binh for the evening. Depart Hanoi in the morning for an approximately 3.5 hour drive that winds through the beautiful countryside to Halong Bay. Upon arrival, board the boat to begin the cruise. Enjoy lunch while cruising towards Vung Vieng in Bai Tu Long. After reaching Vung Vieng, visit the floating village by traditional rowing boat. Enjoy a tea ceremony with traditional Vietnamese tea and then eat dinner while the boat is anchored for the night. Enjoy a drink or join the crew and try squid fishing. Overnight on boat. Earlier risers may start the day with a Tai Chi class on the sundeck or enjoy the breathtaking views of the bay as the boat starts cruising. Breakfast will be served on board while the boat cruises in Bai Tu Long Bay. Take a guided kayaking tour in the Vung Ha area before the boat cruises towards Lan Ha Bay and Cat Ba Island. Enjoy lunch en route. Upon arrival at Cat Bat Island, take a guided biking or walking excursion in Cat Ba National Park and visit an organic farm. Then return to the boat for a cooking demonstration and a barbeque buffet dinner. The remainder of the evening is at leisure. Overnight on boat. Take early morning Tai Chi lessons on board before visiting Sung Sot (Surprise) Cave. Afterwards, enjoy a farewell brunch and check out. Return to Hanoi and enjoy some time at leisure before transferring to the Hanoi railway station for the overnight train to Lao Cai. Upon arrival at the Lao Cai Station in the early morning, transfer to the hotel for breakfast. Afterwards, enjoy a privately guided walk through Sapa's colorful market and stroll down into the valley to visit the small community of Cat Cat. The H'mong that have settled here are a shy and private people, but are welcoming to visitors. A short trail leads off to a waterfall nestled in the ravine below. Enjoy lunch at a local restaurant before returning to a hotel with a private guide and transport. En route stop at Ham Rong Mountain. Then take a chance to climb up the San May (Cloud Yard) to enjoy the panorama of the town of Sapa and to visit the beautiful orchid gardens. Additionally, Ham Rong Mountain has numerous caves and stones in extraordinary shapes to explore. Enjoy a full day privately guided walk with packed lunch to Dao, Giay and H'mong settlements in the Lao Chai and Ta Van Ray districts. The walk is moderate to intermediate and descends into a scenic valley of cascading water crossed by suspension bridges. Lao Chai is a village of the Black H'mong ethnic group. Located 7 km (4 miles) from Sapa, it is quite approachable for travelers coming from Sapa who do not have much time. Once in the village, guests will be welcomed at any of the houses of the hospitable residents. Interact with them and learn about their culture and customs. Next, visit the Giay people of the Ta Van Village to further the experience with the local people. Enjoy lunch at a local restaurant and take the van about 10km (6 miles) to Ban Ho. Take time to enjoy the picturesque scenery along the way, a mountainous area of stunning natural beauty and diverse ethnic minorities. Trek down the hill to enjoy the fantastic open views in Ban Ho, the beautiful valley where the Tay people reside. 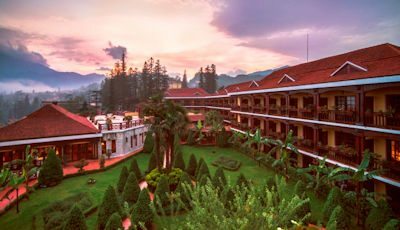 Return to Sapa in late afternoon and enjoy the evening at leisure. Today visit the Ta Phin Village with a private guide and enjoy lunch at a local restaurant. While hiking 15 km (9 miles) to Tha Phin, see local people working in the terraced paddy fields or traveling back and forth between the market and their homes. After a long day of walking on the windy roads and hills around Sapa, soak in a traditional Red Dao herbal bath at Ta Phin. In the evening, transfer back to the Lao Cai railway station for an overnight train back to Hanoi. Note: If this trek covers too great a distance, the route and length of the trekking to given levels of fitness. An alternative 2 km (1.2 mile) trek is available. Please ask a Yampu travel consultant for more details. Arrive in Hanoi early in the morning and transfer to the airport for a flight to Bangkok. Reception at airport and transfer to the hotel. This evening, pick and transfer from the hotel to Manohra Pier (or Saphan Taksin Pier), to board a boat for an evening cruise. Learn more about Bangkok and the Chao Phrya River, a truly magnificent waterway and one of the great rivers in Asia. The river has been a principal factor in the development of Thai heritage, culture, and economy, and is considered the nation's life and soul. While cruising down the Chao Phrya River, enjoy a delicious Thai dinner and watch the panorama change to reveal fantastic treasures from the country's rich past, as well as fascinating modern architectural creations. The Manohra Luxury Cruise will take guests to the King Rama VIII Bridge, where the boat will turn around and head back to the pier. Upon arrival, transfer to the hotel. After breakfast, drive to Wat Pho in time to experience the monks' morning chanting ritual. One of the oldest and most extensive temples in Bangkok, Wat Pho is home to the famous 45m Reclining Buddha. It is also the original school of traditional Thai massage. Continue from there to the Grand Palace, the most important and spectacular royal palace in Thailand. The palace is an architectural wonder of golden stupas, walls and pillars encrusted in shining and colorful mosaics. Previously the residence of the Kings of Thailand, there are multiple palaces within the complex which were used for different occasions; including the beautiful Wat Phra Kaew, which houses the most revered Buddha image in Thailand: the Emerald Buddha. Continue with a walk to the public ferry pier for a short boat ride to Wat Arun, once the grand royal temple to King Rama II. In the early evening, head to the Chinatown neighborhood for a chance to become a Thai food insider. Embark on a behind-the-scenes adventure to indulge in the local sights and flavors of this "foodie" neighborhood. Spend the evening walking around this fascinating neighborhood and trying many Thai culinary delights. Meet the local restaurant owners, hear their memorable stories, and taste delicious samples from famous street vendors, local eateries, and fine dining restaurants. Note: Wat Arun Temple in under renovation so guests will be able to walk around the temple, but climbing the Stupa is prohibited. Ladies should wear a short-sleeved shirt with pants or a knee-length skirt and gentlemen should wear pants and a short-sleeved shirt for religious reasons. Sandals and flip flops are not allowed. Transfer to the airport for a flight to Krabi. Reception at airport and transfer to the hotel. Enjoy the remainder of the day at leisure exploring the city or relaxing on the beach. Early this morning, stop at a local market before boarding a traditional long tailed boat for sightseeing along the Krabi River. Visit caves where stalagmites, stalactites, and bats can all be seen; and mangroves forests where monkeys, water monitors, and many other kinds of animals are also frequently sighted. Return to the pier and visit Krabi Town to do some shopping. From there, head to Tiger Cave Temple (Wat Tham Sua), one of the most beautiful temples in Krabi. Its quiet atmosphere and beautiful plant and flower surroundings are very conducive to relaxation and meditation. There are also several big trees in the area and caves with limestone stalagmites and stalactites to explore. Then, climb the 1000+ steps to the top of the mountain to admire the golden pagoda and beautiful views of Krabi Town and Khao Kanab Nam. Then, enjoy lunch at a local restaurant and proceed to Tha Pom (Klong Song Nam). Tha Pom is a mangrove forest with a stream so clear that the bottom is clearly visible. Admire the beauty of the area while traveling along the wooden walkway through the forest, and then return to the hotel. Note: If the Hot Spring and Emerald Lagoon Tour, Ao Thalen Sea Kayaking Tour, or Rock Climbing at Railay Beach Tour are preferred instead of the Krabi City Tour, please contact a travel consultant. Early this morning, transfer to Nopparatthara Pier and board a speedboat for a 45-minute ride to Phi Phi Island, which is said to be one of the most beautiful islands in the world. This tour will go to Maya Bay, the most famous beach on Phi Phi Island, Pileh Cove, Monkey Beach, and Viking Cave. Viking Cave was renamed "Tam Phaya Nak" by H.M. King Bhumibhol when he visited the cave in 1972. Tam Phaya Nak means "the cave of Naga", the great serpent of Buddhist legend. It is a place much revered by the local people who come here to collect swifts' nests to make Bird Nest Soup, a Chinese delicacy. Phi Phi Lay Island is composed of limestone and steep cliffs rising up from the sea. It is an excellent location for scuba diving, sightseeing, snorkeling and swimming, and there are many beautiful white sand beaches to visit. Enjoy a buffet lunch at a local restaurant on Phi Phi Don Island and then continue to Bamboo Island for more opportunities to swim and snorkel. Late this afternoon, depart from Phi Phi Island for Krabi and transfer back to the hotel to relax. Depending on departure time, spend the day at leisure before transferring to the airport for a flight to Bangkok, to connect with a flight home or continue with an optional Yampu Tours add-on of choice. Halong Bay is known as one of the most beautiful bays in the world. With roughly 1,600 limestone islands, each covered in thick vegetation, it has extreme aesthetic value. Home to a small fishing community of people living on floating houses. Enjoy “junk boat” tours, or a rent a kayak and explore. The charming little town of Sapa is surrounded by gorgeous mountains and rice terraces. It is also known for its rich cultural diversity. The beautiful church in the center of town, and other colonial buildings are examples of the French missionary influences. Visit the Sapa Culture Museum to learn the history of the town, as well as the traditions of the ethnic groups located there. Dubbed the “World’s Best City” by Travel + Leisure, Bangkok is home to a plethora of attractions, and activities. Enjoy a variety of shopping and dining experiences, or the city’s bustling night life. Or immerse yourself in the city’s rich culture by visiting the Grand Palace, any of the several Buddhist temples, or the Bangkok National Museum. While in Krabi, Relish in the sheer beauty of the Andaman Sea by taking a tour to the famous Phi Phi Islands for swimming and snorkeling or just lazing on the beach. Take the opportunity to hang out on the beach or try some kayaking, rock climbing, island hopping or a tour of the town itself. Inspired from traditional junk manufacturing, Victory Cruise is the symbol of Halong Bay’s legendary beauty. Tropical precious wood, fine arts decorations and a devoted staff will lead guests to an amazing journey discovering Ha Long Bay. Victory Cruise is equipped with modern facilities and valorized by fine art decorations. The ship features cabins that offer the ideal support for guests to relax and enjoy the natural beauty, and are equipped with air conditioning, mini refrigerators, and hot and cold water. Guests can enjoy traditional Vietnamese cuisine or international food served by friendly and warm staff, take advantage of the spacious sundeck, or partake in a Tai Chi class. Dragon’s Pearl Junk is the bigger cruise option for groups in the Indochina Junk family. The boat features 11 cabins and 3 decks with both outside and inside dining areas. Each cabin is beautifully decorated in a traditional style and equipped with modern amenities for a comfortable stay. Large sea view windows allow guests to enjoy the fantastic landscape outside, from the comfort of each room. The sundeck on top is a great place to view the bay at sunset and have an enjoyable time with friends. Whether dining in the restaurant, lounging on one of the 2 sundecks or relaxing in the comfort of a cabin, guests are surrounded by handcrafted teak and oak fittings. Discovering a Natural Wonder such as Halong Bay at its best requires the highest standards in terms of services. As for the luxury standards, Image Halong Cruise while 3 similar Image boats, each of 22 cabins. The modern cabins are equipped with air conditioning, handmade furniture, private balcony, and private bathroom. Guests can partake in Tai Chi or cooking classes, try squid fishing, or explore the waters by kayak. Image Halong Cruise also includes a bar and restaurant and a sun-deck, providing guests luxurious experiences. At the hub of Bangkok, on one of the city’s longest and most historic thoroughfares, Sukhumvit Road, lies Adelphi Suites Sukhumvit by Compass Hospitality. As a serviced apartment in Bangkok, Adelphi Suites combines a residence-like atmosphere with the usual warm Thai hospitality, making it a fitting choice for long or short stays. The 93 units of studios and suites are designed in a contemporary Asian style and enjoy all the modern comforts, including high-speed internet, Satellite TV, and private bathrooms. Adelphi Suites features an outdoor swimming pool, a fully-equipped fitness center and Monsoon Café and Restaurant that offers a delicious range of local and international dishes. Contemporary City Oasis Chatrium Residence Sathon Bangkok offers a sanctuary away from the bustle of Bangkok whilst still minutes from the central business district and trendy shopping neighborhoods. For short or long stays, the comfort crafted studios and suites provide all the amenities of a hotel. Guests will find everything needed from three restaurants and bars, self-serve launderette and a resort-style lagoon swimming pool. Green Leaf Spa offers sensorial escapes, whilst a driving range and snooker table allow relaxing recreation. Chatrium is born from a passion to deliver uncompromising, warm service and an authentic destination experience. Shanghai Mansion is an award-winning boutique hotel in the heart of Bangkok’s historic Chinatown, one of the city’s most fascinating neighborhoods. Guests will be transported to a bygone golden era, where the old world romance of 1930’s Shanghai meets new world Shanghai-chic. Each of the 76 rooms are indulgently decorated Chinoise-style complete with fine linens, plush textures and rich hues. A sleek, quirky new lobby lounge and a refreshing welcome drink will instantly make guests feel welcome while the bold, eclectic and glam Red Rose Restaurant brings The Jazz Age to Chinatown. The pièce de résistance: a grand staircase and soaring atrium, centered on a fish-filled water garden. U Sathorn Bangkok is located in a peaceful part of the capital where natural beauty sits alongside the hustle and bustle of this busy Bangkok district. Luxuriously appointed U Sathorn consists of 86 rooms in three low rise three floor buildings set in a courtyard style surrounded by large and spacious gardens with a swimming pool as the centerpiece. The rooms feature complimentary Wi-Fi, minibar, LCD TV, and private bathrooms. J’AIME by Jean-Michel Lorain at U Sathorn Bangkok is destined to becoming a talking point among Bangkok’s gastronomes with its fresh and unique approach to eating out in a city with a gamut of first-class dining establishments to choose from. Deevana Plaza Krabi Aonang offers chic accommodation in contemporary low-rise buildings located a short distance from Ao Nang Beach. With 213 stylish rooms and suites, each with a private balcony, you can enjoy the resort’s excellent facilities and benefit from gracious and personalized service from the welcoming Deevana team. The brand new resort features an exceptional restaurant and bars, three outdoor swimming pools, a kid’s pool, a restful and rejuvenating spa, and outstanding meeting and event facilities. With thousands of Limestone Mountains and cliffs jutting from its calm water, Halong Bay is a Unesco World Heritage site and one of the world’s most spectacular natural wonders. The Indochina Sails, traditional junks built of Aromatic wood with modern facilities and first class service is perfect vessel for exploring this magnificent seascape. All of Indochina Sails’ boats are built to the highest standards and designed to incorporate traditional style and modern facilities. They are built entirely of aged wood, providing a rich and warm ambiance. All cabins come with well-appointed amenities including separate bathrooms with a massage shower, a mini fridge, air-conditioning, and wardrobe. Inspired by traditional and classical beauty of ancient junks of Ha Long Bay, Victory Star Cruise was designed in respect of traditional features but equipped in modern and luxury style. The cabins of Victory Star are comfortable and feature air conditioning, mini refrigerators, and private bathrooms. The spacious and comfortable restaurant serves delicious Vietnamese cuisine, and offers cocktails and karaoke after dinner. Guests can also enjoy lounging on the open-air sundeck, swim or kayak through the waters of the bay, or unwind with a massage in Victory Star’s private salon. In the remote north-west highlands of Vietnam, Victoria Sapa Resort & Spa is a traditional mountain chalet; complete with stone-hearth fireplace and luxurious new spa which is 1,650 meters above sea-level in the Hoang Lien Mountains and close to the Chinese border. Amid spectacular scenery beneath Vietnam’s highest peak, the 3,143-metre Mount Fansipan, the cool, pristine region is home to more than 30 colorful hill tribes � with tours to their minority villages and markets the highlights of any visit. Set on the banks of the grand Chao Phraya River, Anantara Riverside Bangkok Resort is a thriving oasis offering a unique way to experience the City of Angels. Majestic palms swaying in the breeze. Spa treatments hidden within lush tropical gardens. Luxurious suites lit by the twinkle of the city skyline. Delectable meals fusing tastes from around the globe. Situated on 11 riverside acres of verdant gardens, Anantara Riverside Bangkok Resort seamlessly blends the thrill of urban living with the serene charms of tropical luxury. Imparted with Thai tradition and legendary Anantara service, this exotic Bangkok resort offers a respite from the hustle and bustle of the busy metropolis. AriyasomVilla is a small luxury boutique hotel with just 24 guestrooms, a restaurant (Na Aroon), Thai Spa (Som Sen), small function room and meditation hall. Our Na Aroon restaurant serves vegetarian and seafood, no meat. This may seem strange to some but please do try the fresh, tasty, zesty and healthy Thai Cuisine. The rooms are spacious and stylishly decorated, and are equipped with Wi-Fi, flat-screen TV, and private bathrooms. The hotel features an beautiful outdoor pool that is large enough for laps, and a spa offering a steam room, Jacuzzi, and a variety of massage treatments. Bangkok Boutique Hotel offers turn-of-the-century grandeur yet with decidedly contemporary and sometimes even whimsical twists. The hotel offers 174 guest rooms and suites, where interior design and décor exude an interplay of classic European signatures juxtaposed against ornate Asian motifs. Hotel Muse’s abiding theme is evinced just the same in distinctive dining and entertainment venues like Medici for superb Italian cuisine; Le Salon for tea and the city’s best martinis; The Speakeasy; and Babette’s, serving prime steak in the city against a glittering city backdrop. In addition to a rooftop lawn the hotel features within The Speakeasy a cigar lounge for lighter but no less absorbing pursuits. The newly renovated Pullman Bangkok Hotel G provides style and class in laid back rooms and restaurants that remind you of what freedom is all about. This lifestyle hotel features 469 stylish rooms with floor to ceiling window overlooking Bangkok Skyline, al equipped with flat-screen Satellite TVs, Wi-Fi, and beautiful private bathrooms. The trendy hotel has a wide range of cutting edge food and beverage outlets, including the 25 Degrees burger bar, and Mistral featuring gourmet Asian and Western cuisine. The hotel also features a state-of-the-art wellness center, offering a gorgeous outdoor swimming pool with stunning city views, a well-equipped fitness center, and the Anne Semonin Spa. Paradise Privilege, the small and most intimate Vietnamese cruise in Halong Bay, is an invitation to explore this world wonder bay while enjoying all the essentials for a Halong luxury cruise trip. The Paradise Privilege takes in all of the major sights of Halong Bay including Surprise Cave and SoiSim Island as well as giving you opportunities for kayaking and swimming. The menu will be traditional Vietnamese food done well, with a variety of different dishes to suit all tastes. Both Paradise Privilege boats feature three cabins, all spacious and exquisitely elegant, and provide absolute comfort and breathtaking views. Experience the beauty of Halong Bay, Vietnam’s top attraction, on the luxury Halong Violet Cruise. The Halong Violet is fitted out in the 1930’s Indochina style. The comfortable and elegantly designed cabins are equipped with exclusive amenities such as LCD TV, minibar, air conditioning, Jacuzzi tub, and private balcony. The boat features a boutique dining room, a library and lounge area, a well-equipped fitness room, and a luxurious spa. Enjoy catch-of-the-day seafood or Vietnamese fusion cuisine, and indulge with a glass of champagne while watching the sun set over the bay. Jasmine Cruise Halong Bay will set the standard for services and amenities on the bay. Fitted out in the 1930′s Indochina style, the Halong Jasmine will feature 22 spacious cabin, restaurant, lounge and two special Jasmine Suites with their own jacuzzi & balcony for uninterrupted views of the bay. The attention to detail and quality of design is apparent in every inch of this junk, artfully marrying space, rich 1930’s Indochina-style wooden décor and exquisite ornamentation throughout its air-conditioned bedrooms, restaurant, bars and communal spaces. In the remote north-west highlands of Vietnam, Victoria Sapa Resort & Spa is a traditional mountain chalet; complete with stone-hearth fireplace and luxurious new spa which is 1,650 metres above sea-level in the Hoang Lien Mountains and close to the Chinese border. Amid spectacular scenery beneath Vietnam’s highest peak, the 3,143-metre Mount Fansipan, the cool, pristine region is home to more than 30 colourful hill tribes � with tours to their minority villages and markets the highlights of any visit. The Okura Prestige Bangkok hotel is a stylish, elegant, luxurious and contemporary five-star hotel located at the heart of Thailand’s capital city. The hotel combines unrivalled levels of comfort and convenience with the warmth and charm always associated with genuine Thai hospitality. All 240 rooms and suites enjoy impressive views of the Bangkok skyline, and are equipped with flat-screen TVs, Wi-Fi, and luxury bathrooms with rain showers. Three outstanding restaurants offer dining options for every social and business occasion. Guests can also relax by the gorgeous outdoor pool, stay fit in the state-of-the-art fitness center, and find peace and tranquility at The Okura Spa. Along the vibrant Chao Phraya River lies the unique Shangri-La Hotel, Bangkok. The hotel’s spacious lobby, luxurious rooms and suites, which offer a mix of traditional Thai style and modern comfort, and spacious balconies create a memorable “home away from home” experience. Admire the sunrise and fantastic view of the Chao Phraya River and rest by a stunning free-form outdoor swimming pool. Restore balance and harmony to mind and body in the calm surroundings of CHI, The Spa at Shangri-La. Savor Thai dishes in a traditional Thai teak pavilion or on a veranda facing the river at the hotel’s Salathip Restaurant while enjoying graceful classical dance performances. Siam Kempinski Hotel, the city-resort adjacent to Sa Pathum Palace, is part of Europe’s oldest luxury hotel group, Kempinski Hotels. Located next to Siam Paragon, this luxurious “resort within a city,” boasts 401 plush rooms and lavish suites. With its aim to create a sanctuary in the heart of the city, all rooms overlook lush beautifully landscaped tropical gardens awash with a cornucopia of flora and fauna, with 22 of them enjoying private access to the pools in the garden. In fact, it is the first and only hotel in Bangkok to offer the most unique and exclusive experience. The hotel offers a variety of restaurant outlets which will ensure that no culinary wishes are left unfulfilled. SO Sofitel Bangkok commands a prime central location on the corner of North Sathorn and Rama IV roads, directly opposite the green expanse of Lumpini Park, the inner city’s green oasis. Matching design creativity with advanced technology, SO Sofitel Bangkok is the first hotel in Asia to offer a fully connected lifestyle, with all of the 238 rooms and suites equipped with flatscreen LCD televisions, Wi-Fi access, and unprecedented access to entertainment and guest services at the touch of a button. The hotel also features an outdoor infinity pool, a fitness center with yoga classes and more, and a spa offers a wide range of beauty and body relaxation treatments. Paradise Peak is Paradise Cruises’ latest masterpiece, a sumptuous floating hotel that has redefined the boundaries of luxury cruising by providing a supreme level of indulgence to its prestigious passengers in their most memorable Halong Bay Tours. In all aspects, Paradise Peak seems to mirror the splendor and majesty of the surrounding scenery offered by the Heritage Site Halong bay. Paradise Peak does not only offer an exclusive cruising bay experience, it allows guests to dream with eyes wide open. Paradise Peak offers in total 8 stately suites for an infinite comfort and care, and all facilities have been designed with the utmost elegance. For more than 140 years, travelers have followed the Chao Phraya River to stay at the legendary Mandarin Oriental, Bangkok. A luxury five-star hotel in one of the world’s most exciting cities, we enjoy a reputation for style, service and excellence. Combining elegant Thai style with seductive modern touches, each of the rooms and suites enjoys its own distinct character. They are all equipped with air conditioning, flat-screen TVs, Wi-Fi, and private bathrooms. Mandarin Oriental features a state-of-the-art Fitness Centre, two different swimming pools, tennis and squash courts, yoga programs and more. There is also a full service spa offering pioneering therapies and a holistic philosophy. At The Peninsula Bangkok, Peninsula luxury is met with sophisticated Thai charm for the ultimate cultural experience, from the hotel’s iconic Peninsula Green Tuk Tuk to an adventure down the Chao Phraya River and sumptuous authentic Thai cuisine featuring recipes used by generations of Palace cooks. The epitome of luxury Thai style and comfort, guest rooms and suites at The Peninsula Bangkok all command magnificent river views. Intelligently designed, marrying traditional style elements with all the conveniences of state-of-the-art technology. The hotel features a beautiful 3-tiered swimming pool, a well-equipped fitness center, a tennis court, and a full service spa. Along the River of Kings, nestled amongst Bangkok’s historical palaces, temples and museums; a lucky few will happen upon the boutique gem, The Siam. Set on 3 acres of premium river frontage, the privately owned and operated 39-room luxury retreat will transport guests to a bygone serenity suffused with priceless antiquities, oriental allure and contemporary comforts. An irresistible array of bespoke cultural amusements await guests at The Siam: explore Bangkok by boat from the private pier; indulge in pampering at the seductive spa; explore the grounds and discover a veritable treasure trove of curios; or simply unwind with a sunset cocktail at the riverfront bar. All in all, this was a great trip. I am reminded of something I read in a travel book some years ago which said Here’s what I love about travel; strangers get a chance to amaze you. In Myanmar, I found myself constantly amazed. I would love to go back and pick up the areas of the country that I missed on this trip and spend more time in the sites that I found to be particularly interesting and which required more time than I had on this trip to do them justice. I think things will begin to change rapidly in Myanmar now that liberalization has begun. I appreciate all the work Yampu staff put into developing this custom itinerary for me, and I wish all of you great success in building your business in Myanmar. Thank you for making our stay fun and memorable! We had a wonderful trip! Yampu was wonderful in giving us different options to make our trip more customized to suit our needs. Our guide was also very knowledgeable and helped make our stay in Singapore fun and effortless. We all enjoyed the itinerary- not too packed with activities and everyone enjoyed the gardens, the animal safari, and city tour. The bus and vans we rode in were comfortable and the air conditioner was much welcomed in the tropic heat! The vacation was wonderful. My husband and I had a great time. We really enjoyed the services you had arranged. A few things really stood out to us. 1. The Tour Guide at Bangkok Tanat, I believe his name is, was the superman of accommodation. He not only fitted our wishes or demands in helpful ways, but put in extra effort in many small aspects of the trip. We were completely satisfied with his service and would recommend him to any customers. Pass on the compliment if you can. 2. The Adelphi Suites in Bangkok- Fantastic hotel. Great location, friendly staffs, clean rooms, in room internet, affordable rate. I can’t ask for better. 3. Service and Hotel in Chiang Mai. Although in comparison to what we received in Bangkok, the accommodation lacked magic sparks. But everything was to our satisfactory. The tour guide there was able to arrange for a last minute cooking class when we asked. That turned out to be an outstanding experience. 4. Phi Phi Island Spa and Resort – I cannot describe how scenic Phi Phi island is. And the resort did a wonderful job presenting it to their guests. The beach is small, but private. The view off to the ocean calms one’s soul. The staffs are friendly and helpful. The Spa service lives up to its name. The only two problems are super expensive mediocre food and mosquito breeding ground. But we were able to overlook them. It was a nice get away from the cities’ hustle and bustle. Thanks for making our trip memorable. I definitely would like to work with you again on my next adventure.